The real you is the person you are when nobody is watching. But when other people enter the picture, things can change. You can change. You see a person or a group of people. You analyze their personality, preferences, and relationship to you. You change based on how you wish to be perceived by the person/group. It’s how a rough-around-the-edges guy becomes prince charming to get a girl. It’s how a shy high schooler with no prior interest in drugs starts doing them to fit in. It’s how a jokester acts serious around serious people so as not to offend anyone or get embarrassed. It’s why some people like to keep friend groups separate, because they use a different identity with each group. There are benefits to altering yourself (such as fitting in nearly anywhere), but the consequence is that every time you do it, the real you is hidden, and with enough repetition, you can lose yourself in a pile of masks. It will never feel quite right either, because the real you is the only version that feels completely natural. I read a story on Reddit about a guy who used a fake Australian accent one day. His convincingness impressed quite a few people and he got a kick out of it. Eleven years later, this American is still believed to be Australian – complete with a fake history he made up – because he never stopped pretending. He said his whole life feels like a lie and he doesn’t know how to get out of it. To be yourself, don’t worry about yourself. It’s only when you analyze how you come across to others and what others are thinking about you that behavior modification seems appealing. When you look at others with yourself in mind, it’s like using them as a mirror – you try to see yourself through their eyes and adjust the image accordingly. When you’re by yourself, however, there’s nobody around to impress; no one to analyze. It’s just you, and because of that, you don’t focus on yourself, but on what you’re doing. 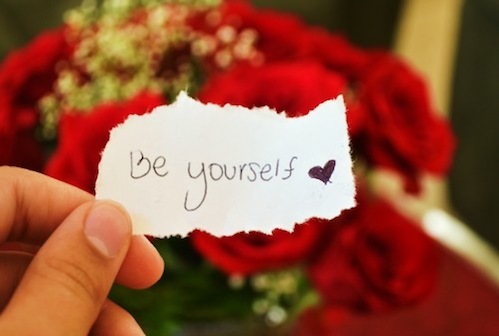 It’s the answer to how to be yourself all the time. Shut down your inner clamoring for approval and focus on being present in the external world. You’ll have a lot more fun. 1. You instantly become a better listener. In the times I’ve not been a good listener, it was because I was thinking about myself or what I wanted to say. In the times I’ve listened well, I was present in the moment and tuned into the conversation, rather than worrying about myself. 2. You will be less manipulative. When you’re trying to adjust your hair in the mirror, you might look at it from different angles, try a few styles, and even tilt the mirror. Similarly, when you try to adjust your image through the eyes of another person, it often results in subtle manipulation to get them to see you in a different way, and people hate being manipulated for obvious reasons. If you’re being yourself, the real you is the person they see, and they’ll subconsciously appreciate your straight-forward identity; of course, people will still misinterpret who you are, but that will happen no matter what you do. 3. Many people will like you more. When you act like yourself compared to managing your image, some people will like you more and some will like you less, and that’s the way it should be. People pleasers are often the ones who aren’t themselves, because they want to be liked by everyone, even though that is impossible with nearly 7 billion unique personalities and value systems. Be yourself and the people who naturally like your personality, will really like you for being genuine, and that’s worth it. 4. You’ll feel more relaxed. Managing an image takes a lot of effort because you have to stifle your natural tendencies, analyze the environment, and fabricate a suitable image. But being yourself takes no effort at all – you react and live from the heart, so to speak. It’s relaxing to know that you don’t have to put on a front because you’re comfortable in your own skin! Do not aim to please. if you have to aim, you’re not being yourself. Even in situations of courtesy, you can act from your value of being courteous, rather than from wanting to appear courteous – let it come from within. Focus on being fully present in your external environment (rather than in your own internal world); react and create without over-analyzing. Do not worry about how others see you, or it will unnaturally alter your behavior and probably make you seem insecure. Get to know yourself. Take time to reflect on your values and how you really want to live. Learn to appreciate who you are now – faults and merits – and others will too. If you wish to change who you are, first develop your focus skill. Then, I recommend staying focused on changing one big area or perhaps two small areas at a time (whatever your willpower will allow, which typically isn’t much). Do you want to change yourself but feel overwhelmed or don’t know where to begin? If so, or if you want to learn more about what it takes to focus, I recommend reading the articles here. If you can focus, you can change your life. If you can’t focus, you can’t change your life. It is that simple and that important. More focus articles are coming to Deep Existence. Click here to be informed when they arrive. Hello sir . I loved your article.The part of how to not be yourself was really an eye opener. This is life changing. True happiness is being yourself. Life becomes fun when you love yourself. Thank you so much for this article. I hope you understand your impact on people. Extremely impressive article. If you were interested in playing online dice games then from here you will play online yahtzee game on your pc without any download and signup the goal in the game is to score more points than your rival by eliminating them.